While one might suppose that the plague of school shootings is a strictly recent phenomenon for our degenerated times, Benjamin Ratcliff hanged in Canon City, Colorado on this date in 1896 for gunning down the entire school board of Jefferson district, Park County. 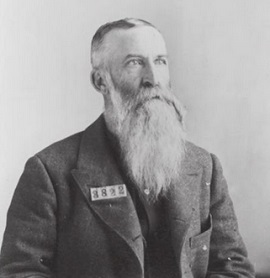 An “aged and eccentric ranchman,” Ratcliff had his homestead in the Tarryall Creek area which he maintained with a son and two daughters — motherless ever since his wife Elizabeth passed away in 1882. One of the daughters had suffered a crippling injury that left one leg shorter than the other. She walked with a permanent limp. Among the many woes this imposed upon her was an extreme difficulty reaching the Michigan Creek school, which sat on another ranch seven miles away from the Ratcliff home. Ratcliff petitioned unsuccessfully for some manner of accommodation but so far was the school board from consenting that he caught wind of a rumor allegedly being circulated by one of its number to the effect that Ratcliff pere had incestuously impregnated his own 18-year-old daughter. Spitting mad, Ratcliff stopped by the schoolhouse on election day — May 6, 1895 — to air his grievances. When the school board arrived to open the polls he picked a fight that ended with Ratcliff gunning down all three members of the board with his Winchester rifle: Samuel Taylor, Lincoln McCurdy, and George Wyatt. 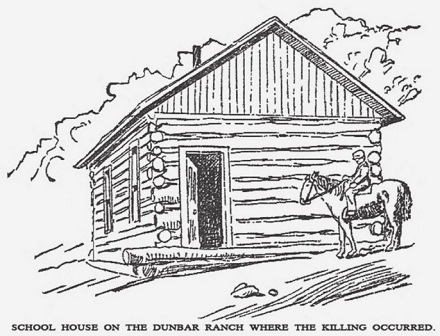 Archival sketch via Park County (Images of America). Four years before Ratcliff hanged, another settler who lived about 30 miles from the Ratcliff ranch had disappeared. Gottlieb Fluhmann was never accounted for in his own time, but his apparent remains were accidentally discovered in 1944; Ratcliff has sometimes been speculatively credited with that murder, too — though Ratcliff descendants reject that imputation as so much rehashed gossip. On this date in 2004, Mamoru Takuma was hanged for one of the most notorious crimes in modern Japan — the Osaka school massacre. 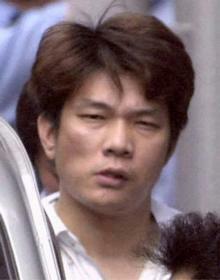 On June 8, 2001 — a day the 11-time arrestee was due in court for assaulting a bellhop — Mamoru Takuma (English Wikipedia entry | Japanese) entered the Ikeda Elementary School in Osaka and knifed 20-plus people, killing eight young students. Even when taking on 7- and 8-year-old children, that’s an astonishing body count for a guy packing only a blade. Some staff at the school finally tackled the guy. Takuma had been institutionalized even more often than he had been arrested, so the shocking crime pitted public outrage against the judiciary’s capacity for handling mentally ill offenders. Guess which won out. In the wake of the crime, in fact, the government toughened laws on crimes committed by mentally ill offenders. Takuma was hanged barely three years after the attacks, and even though he pushed for his own execution, the lightning-fast completion of the sentence (most death penalty cases in Japan drag on for decades — here’s an extreme example) raised misgivings both domestic and international. Though his case remains an outlier, those concerns already seem a bit passe: Takuma also turned out to presage the distinctly more aggressive pace of executions in Japan in recent years.